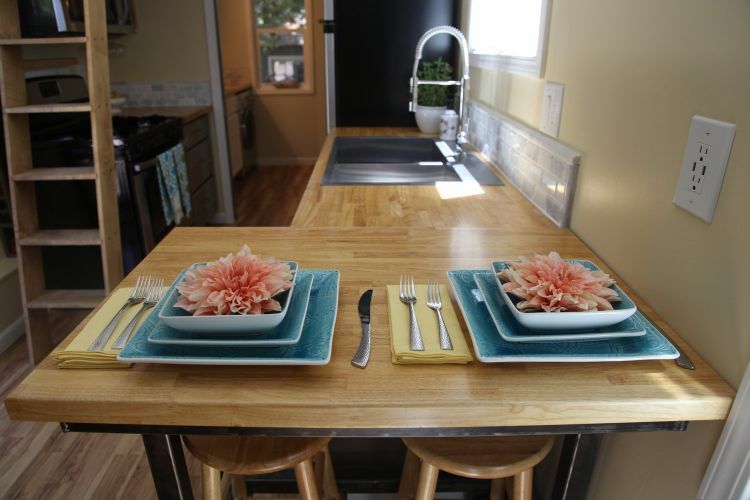 Just because a home is small doesn't mean it has to skimp on design or compromise on style. In fact, this 300-square-feet home is filled with elegant touches, chic details and modern decor that adds delight to this little but lovable space. 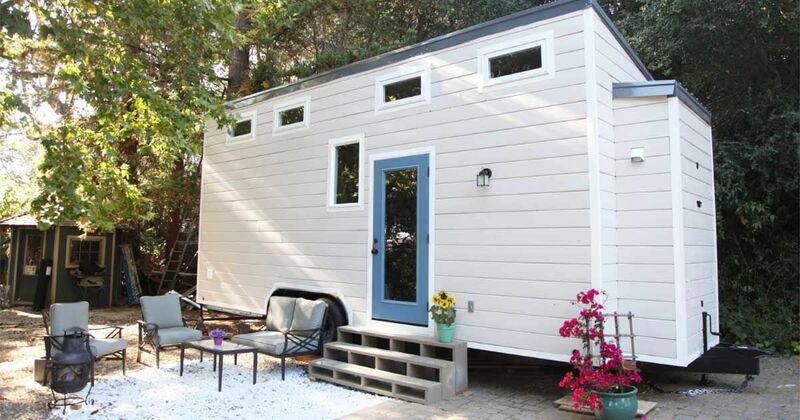 It's the creation of the Redwood City, California, company, Dream Big Dwell Small. 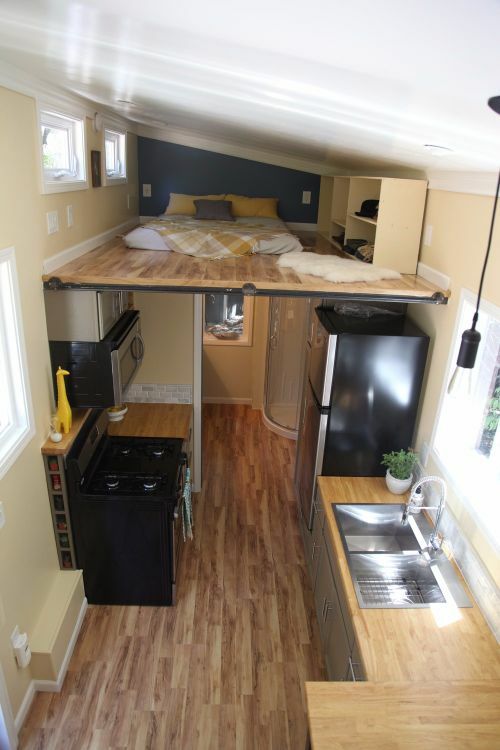 Elevated ceilings give the impression of roominess, and the overhead loft is a fabulous space saver. Plenty of windows allow for natural sunlight to stream inside this sweet home and add an inviting warmth. You'll also love how the customizable design allows for interior changes as necessary, making it even more appealing. As you step inside the home, you'll notice everything you need is right there, without the impression of crowding. Airy, bright and light, this window-filled home is a pleasure to tour. A living area with a couch gives way to one of the home's two lofts, meant to add even more room. 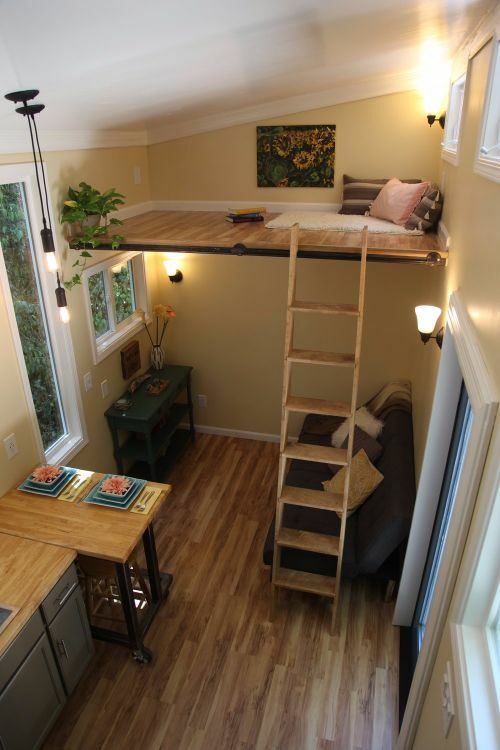 This 4-foot, smaller loft functions as a second living/sitting space or a cozy, private reading nook. Imagine a cup of coffee and a wonderful novel in this window-lit space! A perfect way to spend an afternoon. An oak ladder gets you easily up to each loft. Maple floors create an inviting feel, and tiny touches like crown molding and pendant lights make the home chic and contemporary. The lofts add a really cool touch to this home, and let's face it, who doesn't still want to climb ladders and have a nifty spot to sit in, like a childhood clubhouse? 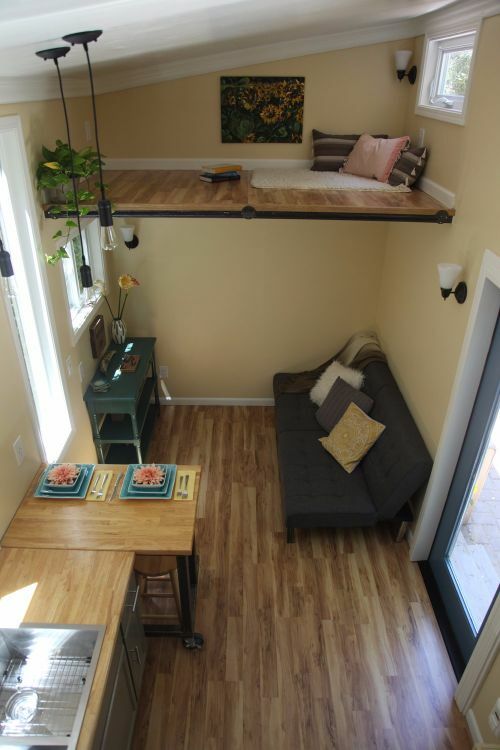 The larger loft, measuring 105 square feet, serves as the home's sleeping space. 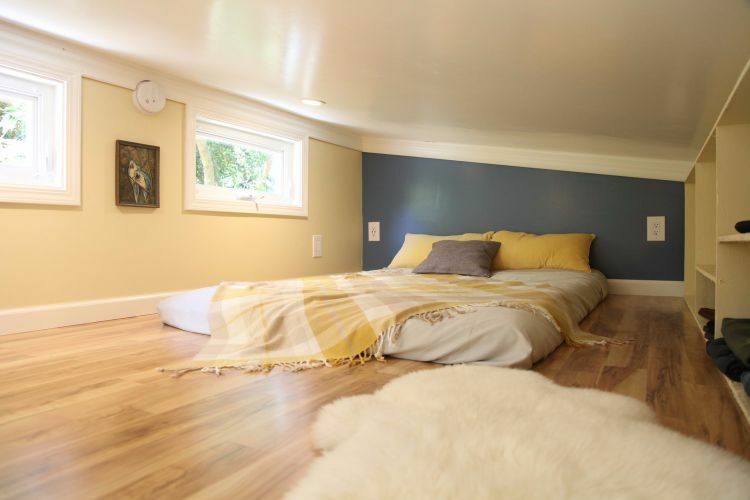 Large enough for a California king mattress, the loft also offers space for storage shelves or drawers. Windows let in plenty of light and provide a charming space for sleeping and relaxing. 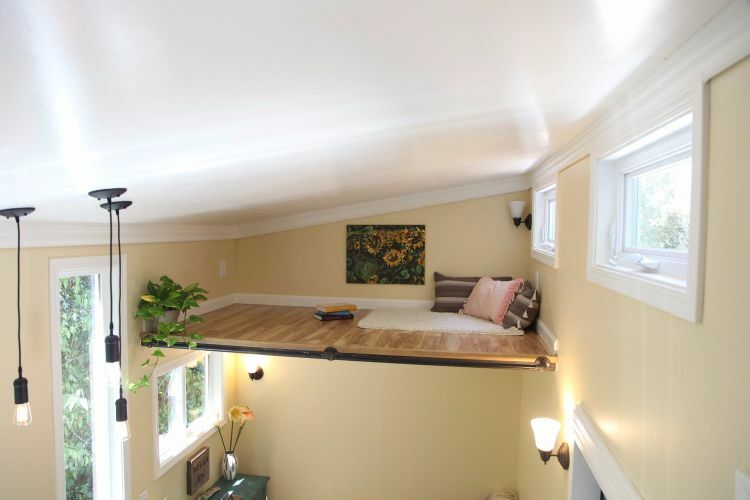 This close-up of the sleeping loft shows you how cute the space really is. The area is customized with a blue wall and hanging artwork, along with custom shelving for storage. 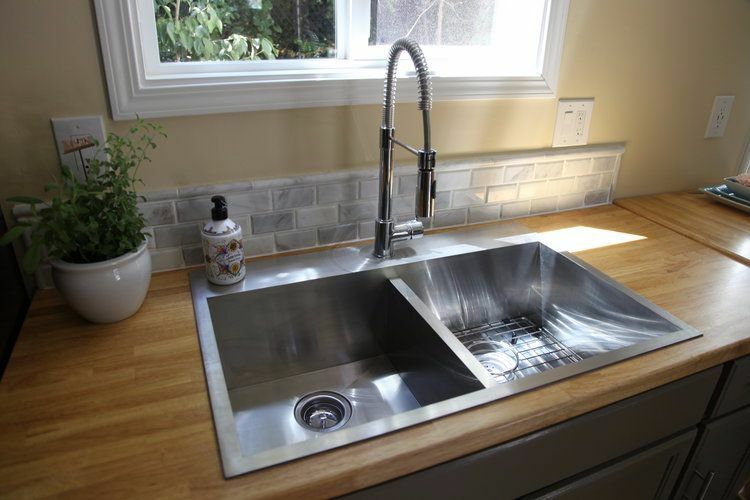 The state-of-the-art kitchen includes a stainless steel sink, refrigerator and appliances, along with oak cabinets. Luxurious details, including custom wine shelves, hardwood butcher block counters and marble backsplashes, add elegance to the space. There's plenty of room to dine at the movable butcher block when you add bar stools to the space. 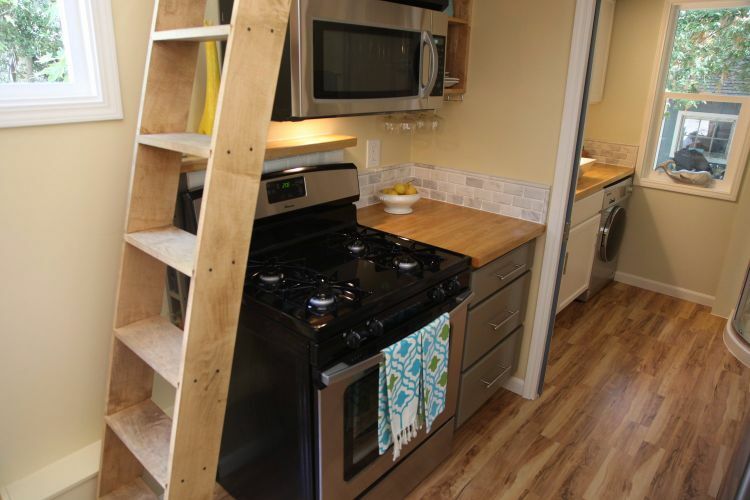 The kitchen includes an overhead microwave, full size oven/range and lots of cabinet space. 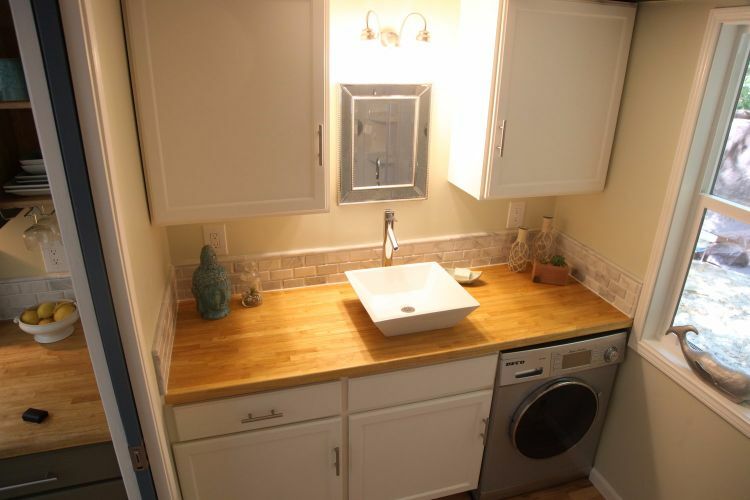 A laundry room features a washer/dryer unit and space to store soap and other necessities. The bathroom is a wonder in itself. 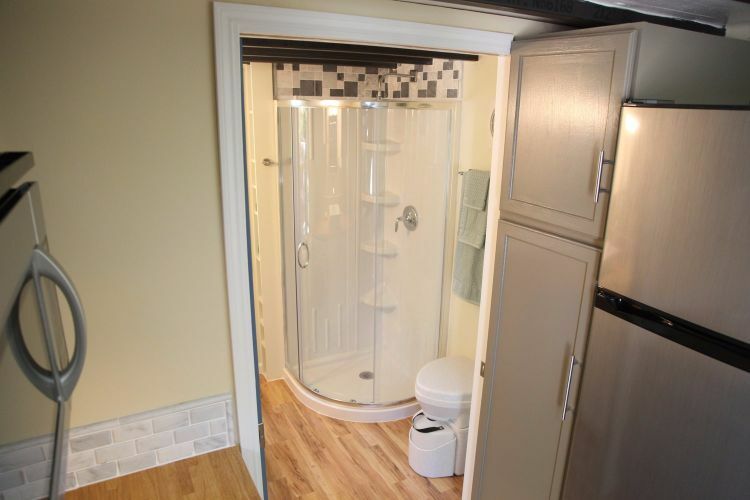 Located directly off the kitchen, the room features a beautiful round glass shower with a rain shower head, along with a composting toilet and china sink. Built in shelves allow for storage. This space looks like the ideal spot to while away a day! 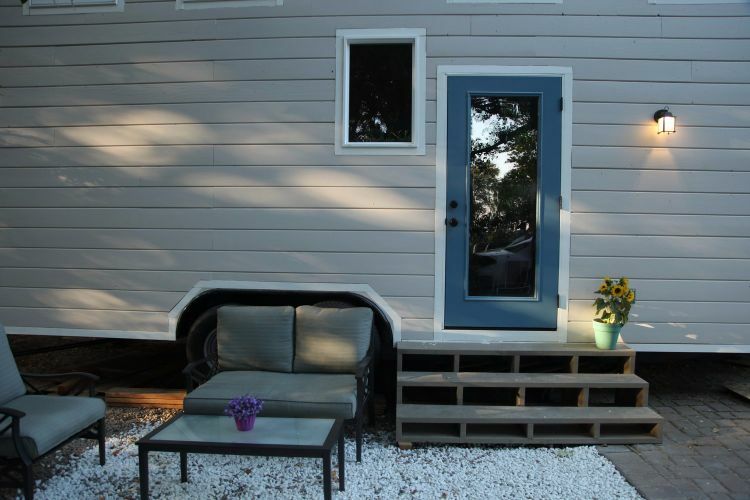 The exterior features a table and chairs for lounging outdoors as well. 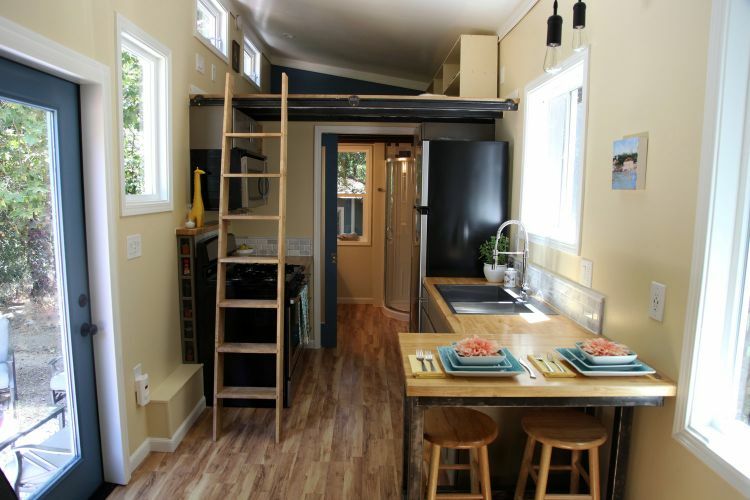 As you can see, this tiny home is packed with features. Don't miss any of the updates of Dream Big Dwell Small on Facebook.